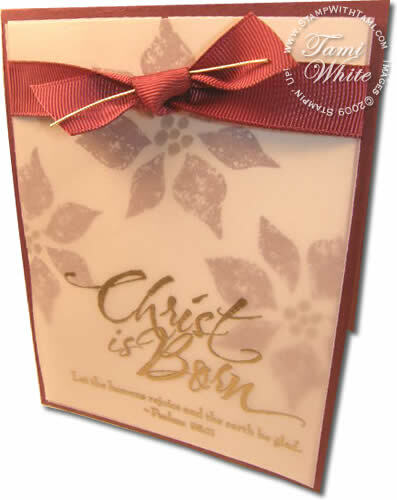 Join me for today’s video tutorial and see the sheer elegance of embossing on vellum with the Christ is Born stamp set. The video also shows techniques such as embossing with a Versamarker & Faux knots. The result is stunning! Stampin Up Vellum Christmas Card by Tami White from Tami White. Card Supplies – All Supplies Stampin’ Up! I love the look of this card and the embossed vellum can be used in so many ways. I may use this idea for my daughter’s 1st communion invitations! Thank you! this is a very beautiful card. Thanks for your videos!! I love them!